Wild & Scenic Chetco River (Andy Maser Photo). Recreational opportunities, including fishing for large salmon and steelhead trout. 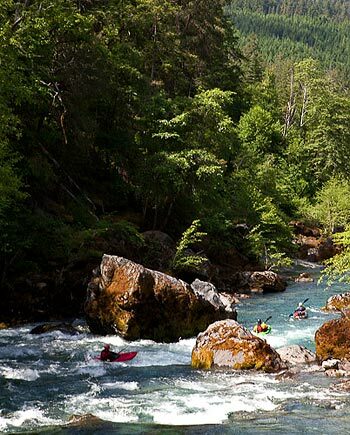 The Chetco River is the epitome of America’s Great Outdoors. You'd think it would be permanently protected through this Act of Congress, but because of a 138 year old mining law that's still in place and equally archaic government policies, it's not. Beginning in 2008 plans have been submitted to the Rogue River-Siskiyou National Forest to mine almost 24 miles of this otherwise protected Wild and Scenic River for gold. The Forest Service says they can't prohibit the mining unless it's withdrawn from the 1872 Mining Law and even then withdrawals are subject to valid existing rights. What's being done to save the Chetco and how you can help. Brooking/Harbor at the mouth of the Chetco River during the Salmon Derby (Barbara Ullian Photo). The Wild and Scenic Chetco is a relative rarity among United States' West Coast rivers—outside of Alaska. It has a high percentage of National Forest land (78%) and Congressionally protected Wilderness (44%) in its watershed, with additional potential Wilderness (21%). Chetco in the Kalmiopsis Wilderness. US Forest Service. The Chetco is one of the West Coast's rivers that's undammed from its headwaters to the Pacific—a relative rarity. While there is some supplementation of hatchery fish in its lower reaches, the Chetco is home to native, naturally reproducing populations of chinook and coho salmon and steelhead and coastal cutthroat trout. The upper half of the Chetco flows through the rugged, remote canyons of the 179,000-acre Kalmiopsis Wilderness. Emerging from the Wilderness it continues through the Rogue River-Siskiyou National Forest. The last 10 miles flows through private land to the port of Brookings-Harbor. 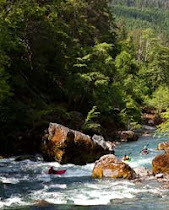 To get a sense of how beautiful this wild river is, watch Oregon Field Guide’s 11 minute video of a 20 mile kayak trip down the Chetco through the Kalmiopsis, one of the wildest wildernesses in the West (where mining is also proposed). Watch this Oregon Field trip "up" the beautiful Wild and Scenic Chetco River with Tim Palmer, Ann Vileisis and Alan Wilson. 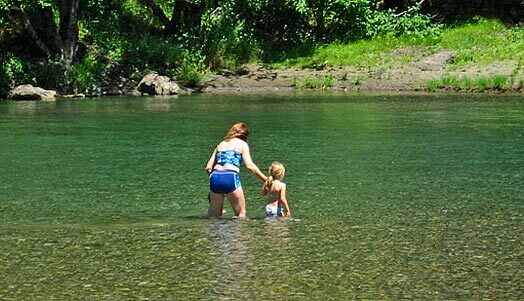 The Chetco River is not only special in its wildest reaches. Angling for its large salmon and steelhead for takes place mostly on the lower river. Here families camp and picnic along its banks. Children wade in crystal clear shallows and teenagers seek its cool depths in the heat of the summer. Wild and Scenic Chetco River at Nook Bar and area threatened by mining (Richard Nawa Photo). The river serves as an exceptionally pure source of water for the communities of Brookings and Harbor. In the winter the Chetco’s salmon and steelhead fishery is an important economic engine for the coastal communities of southern Oregon and northern California. The Chetco River's corridor supports between 150 and 200 species of wildlife, including the federally protected northern spotted owl and marbled murrelet. 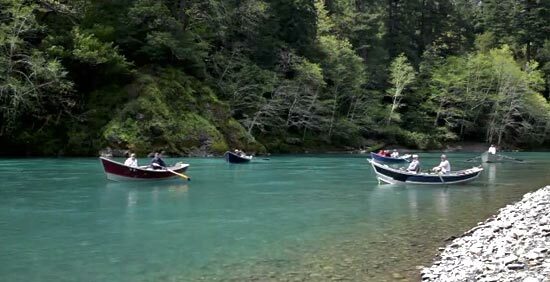 In this time of climate change and declining health of our oceans, the Chetco is priceless as a refuge for self sustaining wild salmon, steelhead and cutthroat trout populations. It’s also a refuge for those seeking the solitude of Wilderness or an afternoon’s picnic in the sun with friends and family. Photo below is Chetco Watershed Council on a dual purpose outing—enjoying the river and cleaning it up. Drift boasts on the Chetco. The offers a unique and quality experience because motors are banned. See also the Rogue River-Siskiyou National Forest's Wild and Scenic Chetco River page.